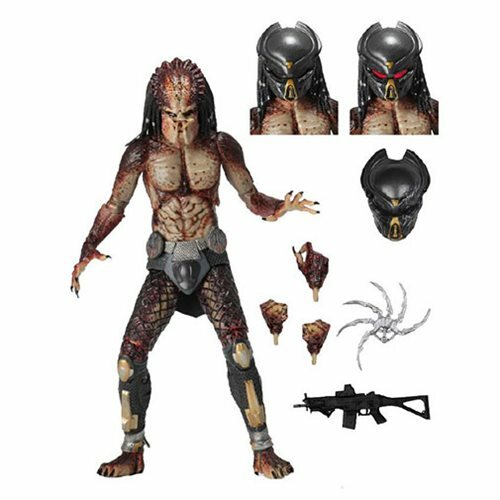 From the 2018 movie The Predator, directed by Shane Black, comes the Predator 2018 Ultimate Fugitive Lab Escape Predator 7-Inch Scale Action Figure! Based on its appearance after it awakens in and escapes from a government research facility, this figure stands over 8-inches tall and features over 30 points of articulation. This version includes 2x new interchangeable heads (unmasked closed mouth and masked with glowing red LED eyes), 5x interchangeable hands, battle damaged mask, shuriken and rifle. Uses button cell batteries, included. Comes in display-friendly window box packaging with opening flap.